Yeppy has been in her foster home for 8 days and she is as precious as ever. She is a quiet girl who LOVES it when her foster mom comes back home from being out. She will put her paws on her foster mom’s leg until she gets some pets and verbal attention. Yeppy is a little “glue dog”, meaning that she followers her person where ever they go with the exception of upstairs. She is very leery of stairs but is getting better. Her foster mom is working with her on navigating them. She just needs to develop some confidence doing them. Although Yeppy wants to follow her foster mom upstairs, she is secure enough to remain calm and not bark when left at the bottom of the stairs. She will find a bed to lie in until Mom comes back down. Yeppy is making quick progress with the 18″ deck at her foster home. She has quickly learned that she has to be cautious until she finds the edge and now remembers that the deck is a safe distance for her to jump down to the ground on her own and she does so the past 2 or 3 days on her own. She is also going up and down the 4 steps leading from the lower yard to the upper yard, so I’m sure steps inside will be learned too. She needs a gate right now at the top of the steps inside until she learns that the mat at the top is a warning that there are stairs to go down. She appears to be a very smart little girl who comes when she is called, and stays inside the open door when told to. There is a trainer coming to visit with her to see if she has therapy dog qualities within the next week or two. Yeppy lives with 5 other dogs, ranging from a 14 pound Shih Tzu to a 65 pound lab/pointer. She blended right in with them from day one. The other dogs are used to fosters and were content to leave her alone after the first minute or two of normal doggy greetings. She was not happy to sleep in a crate the first night so she now sleeps in bed with her foster mom and is the best cuddler ever, nuzzling against her mom’s neck for the first hour or so she is in bed. Yeppy LOVES treat, breakfast and dinner time and has a very good nose! She is able to eat with the other dogs who do not mind others coming close when they are eating. She knows not to get into their dishes when they are eating but if there is any left over, she will gladly take care of it for them when they walk away. She is not food aggressive in any way. So far, Yeppy has NEVER shown any kind of aggression, including quiet growls as a warning other dogs or toward any human. 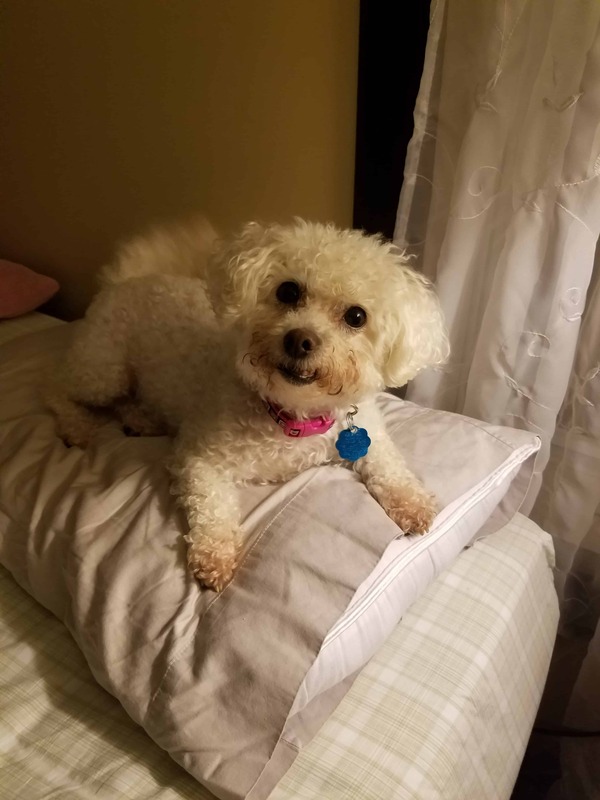 She is a very happy-go-lucky, quiet little girls who loves people and would be thrilled to be a dog that goes everywhere with her human as long as she feels safe and is close by or held by her mom or dad. Yeppy has one skill that she needs a lot of work on and her foster mom is addressing this. She has been trained to potty on pee pads. She is learning that going outside is a good thing, as she is given a small treat, praise and pets every time she eliminates outside. She is excellent at being in bed for up to 10 hours, sleeping, without eliminating so I know she can learn to go outside. Her foster mom will even leave her on the bed in the morning while she showers and then takes Yeppy outside and she has never eliminated during that time. Yeppy has a favorite stuffed toy that she loves to play with but she gets little time with it because she has a foster sibling who loves to destroy and eat stuffed toys. Yeppy would do well in just about any household where she would be treated gently and held often. She is a love-bug!!!!!!! Yeppy arrived with her vet records from the day she was acquired by her original family. 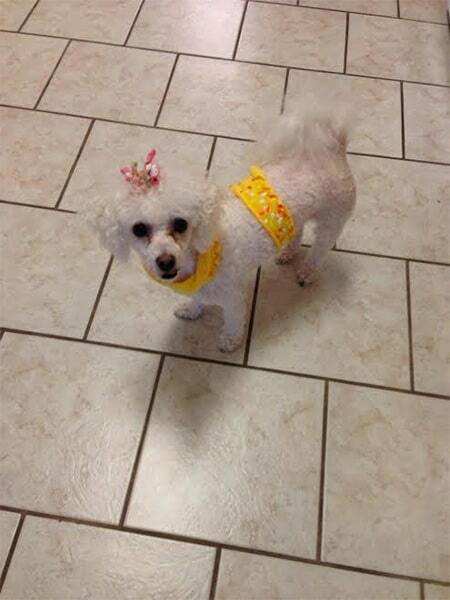 Her check-up when in the care of Blind Dog Rescue Alliance was unremarkable. She is a healthy, happy little pup. She was put on a liquid antibiotic for loose bowels and that has cleared up already. 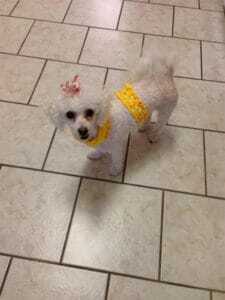 Yeppy is looking for her forever home. If you think it could be yours, read more about Adopting from BDRA before submitting your application below. BDRA relies on your donations to rescue blind dogs around the United States. Please consider giving in support of Yeppy.